A while back, someone from Schmap, an online travel guide, sent me an email saying they were considering using one of my Flickr photos for their Paris guide. Well, it was accepted! It’s kind of a boring shot, but exciting, nonetheless, that they included it. And to think, if it wasn’t for San Francisco’s Amnesia, I never would have taken this image. Thanks, Shawn. Check it out: Amnesia, Paris, on Schmap.com. Click on the bar name and you’ll see a slightly larger photo in the right-hand column. 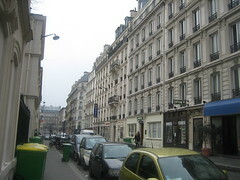 They put it in Montparnasse, but it’s actually in the Marais. On my last morning in Paris, I dashed over to Notre Dame to go up to the transept and see the gargoyles. I love gargoyles, and a few of the ones I have are modeled after the ones at Notre Dame (don’t ask me which ones, I’ll have to compare my photos to them once I get back). One of the midwesterners behind me in line said that they weren’t actually gargoyles, they were chimera. I don’t know the difference, but now I’m semi-inspired to figure it out. I didn’t have a lot of time there, but I’m so glad I went. That was one thing I really, really wanted to do and it was just the perfect time to fit it in. Once again, it was an experience that tied in nicely with the book I was reading, The Hunchback of Notre Dame, and since the sky was so clear, the view was just amazing. And shorter lines than the Eiffel Tower. One of the things I was most excited about doing on this trip was seeing the flea markets (les marches aux puces–literally “flea market”) at Clignancourt and Vanves. People tend to have a strong preference for one over the other, and it’s difficult to sort through all the information as to which is better. The short version is that Clignancourt has a lot of stuff. A lot of crap, a lot of pristine (and expensive) antiques, and a lot of stuff in between, all organized into multiple marches (markets). Vanves has much less of everything–much less junk, much fewer nice antiques–and has more of the feel of an American flea market. And it only takes about an hour or so to meander through. Clignancourt feels like a little city, once you push your way past the booths of jeans, incense, knock-off pocketbooks, etc. (and you do have to push), you get to these organized markets of antiques dealers. Everyone has at least one dining room table in their stall, and around one p.m., I discovered why: they lay out a tablecloth, put out a pretty impressive spread of food, open a few bottles of red wine, gather up their shopkeeper friends, and eat lunch together. It’s really cool. I searched for pots for pots de creme, but didn’t turn up anything. 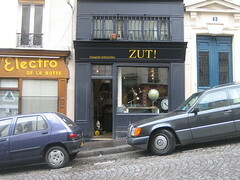 A monsieur, who was very helpful and had a stall of fancy kitchenware, told me they’re very hard to find. I did see a stuffed baby kangaroo and was going to ask the shopkeeper to take my photo with it, but he was eating lunch with his friends and talking to some other Americans. Come to think of it, there was a lot of taxidermy at Clignancourt. By the way, my advice is to head straight for rue de Rosiers a Saint-Ouen when you’re going. That’s where La Chope des Puces is, and it’s also the far end of the nice stuff (Marche Paul Bert has the nicest things). After Clignancourt, I headed for La Chope des Puces, the bar with Gypsy jazz. It’s a tiny place. You enter and the art deco-y counter points right at you. You can take one of the eight seats (at four tables) in the front, stand by the bar, or go and sit at one of the six or so tables in the restaurant part in the back. The musicians–two guitarists–were mostly talking and telling jokes with some friends standing at the bar, but the music I did hear was great. Plus, it was fun to stare at the photos of Django and compare everyone’s version of the de rigeur Django moustache (I liked the bartender’s best). There are lots of funny differences between the French and American cultures. One is how they count floors. When I checked into the Hotel Marignan, they told me my room was on the 6th floor, which I think it was (coming down the spiral stairs every morning, I kept getting dizzy and losing count). But on Sunday, I moved to the Hotel Studia (due to a booking mistake at Hotel Marignan), to a room on the 7th floor. See, the French count the ground floor as zero. In fact, in the department stores, there are numbers at the top and bottom of escalators telling you which floor you’re on. 0=ground floor, 1=second floor (to Americans), 2=third floor, -1=basement. -1 is my favorite. Fortunately, the Hotel Studia has an ascensieur (not sure of the spelling) to the 6th floor, and then I take the stairs up one more. Since the lines at the Eiffel Tower were so long yesterday (and since I was afraid my gift for Neumann and Liz, who I’m staying with in London, would melt in the nice, hot sun), I decided to get up early this morning, eat breakfast (a croissant and small baguette with lots and lots of coffee), and head over there before it officially opened. I got there at 9:10, it opens at 9:30, and I actually got in the elevator to the second floor (en francais, so second up from the ground) at 10:30. While there, I realized that the Americans should be so thankful to the Italians. A lot of the Americans I see in Paris are well-intentioned but a bit clueless (I heard one lady referring to Notre-Dame as “the big church.” Victor Hugo would be mortified). The Italians, on the other hand, make me proud to be an American (don’t worry, Greg and Dad, I was already proud to be an American. Cue Lee Greenwood). On Monday, I took a trip to the Jardin du Luxumbourg, continuing my quest to figure out where parts of Charade took place (I think this may be where the stamp collector was and maybe also where Hepburn and Grant watched the Punch and Judy play and Audrey Hepburn read too much into it). While there, I stopped by Patisserie Sadohuro Aoki, and discovered two funny things. 1) You can’t always rely on addresses in Paris to be in numerical order. If there’s a park or something on one side of the street, the numbers stop–on that side of the street only–then start back where they left off at the next block with buildings. So the Patisserie Aoki, which is at #35, I think, is across the street from addresses in the 70s. When in doubt, keep walking. 2) Just as I was getting proud of myself for figuring out that “tirez” means “pull” and “poussez” means “push,” I encountered the door to Patisserie Aoki, which doesn’t say either. Now, let me just say that this is one of the very, very chic places I found myself in. It’s the kind of place I’d probably be too intimidated to step into in San Francisco. It feels very New York–very, very modern. The chocolate brown, very simple exterior is a sharp contrast to the stark white interior. The tall, slender Asian woman behind the counter looked like she could be a model. So I push gingerly on the door, and it moves, taking my hand with it. It’s a sliding door, and my hand has slid in the gap, wedging itself nicely in. I wrench it out as chicly as possible (grimacing from the pain, as chicly as possible), and walk in. 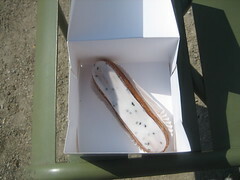 The pastries look amazing, but I went with the black sesame eclair, which was mentioned in the “Paris Confidential” article in Bon Appetit, s’emporter (to go), making a hasty exit and eating it for lunch in the Jardin du Luxumbourg (where some pigeons eyed it dangerously). The weather was gorgeous today. Sunny and warm. I bravely left my umbrella and rain coat in my room and headed to Porte de Vanves for the other big flea market. I bought a gorgeous tea cup and saucer for 10 euro (roughly $15) and a book for 4 euro ($6) to give someone as a gift. Unfortunately, I left them at Cafe d’Enfer, where I had an amazing lunch of marinated duck (with an orange and balsamic sauce, that was really yummy until the sweetness became too overwhelming towards the end) with mashed potatoes and a salad, oddly constructed on the top. I realized after I sat down that this was the kind of place that I’d make fun of in San Francisco. I remembered that I left my bag there halfway through the Musee Picasso, a museum created when Picasso died, and in lieu of paying the inheritance taxes on all the work he left behind, his heirs gave the French government his art. Ah, socialism! On the way back to my hotel, I passed a shop that sold hand-knitted finger puppets and baby sweaters. The madame had the finger puppets grouped by story: Little Red Riding Hood, Goldilocks and the Three Bears, the Three Little Pigs, and a few others. I pointed to the Big Bad Wolf, dressed in grandmother’s glasses, bonnet, and dress, and asked her what he was called in French. “Le loue,” she said (I’m probably not spelling it correctly). Then she pointed to Le Petit Rouge Chapeau (“little red hat”), la grand-mere, la mere, and le chausseur (the hunter). I found it fascinating. I bought le loue dressed up as grand-mere in une robe jaune (a yellow dress–she also had blue and pink) for my nephew, Rex. And yes, I do realize that my family will tease me endlessly for getting him a cross-dressing finger puppet. As I crossed the Seine on my way back, I saw a man with a marionette that was playing guitar (the theme of the day) and singing along to Radiohead’s “Creep.” And about 50 yards down was an accordion player. 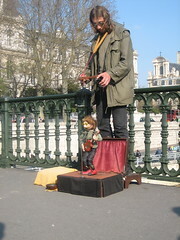 Really, a marionette and an accordion player on a bridge over the Seine on a gorgeous Sunday in Paris? Isn’t that a little cliche? 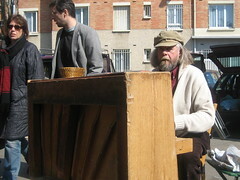 Here’s a busker playing a sweet piano on a rolling cart at the flea market at Vanves. Note the jaunty angle at which he holds his cigarette in his mouth.